Pardon for the lack of table setting when photographing the dish – we couldn’t wait to dig in! This month is a very special month… Because Zoe from Bake for Happy Kids is hosting her 3rd Cook Like A Star, and the chosen chef is one of my favourite chefs – Jamie Oliver! I got to “know” Jamie Oliver a very, very long time ago (when I was about 14/15?) through one of his cooking shows, and I just love the way he hosts his cooking show. He rarely measures his ingredients (except when he’s baking), a lot of time showing off his knife skills (wish I could do the same!) and he’s always grabbing whatever is near him and adding it to his pot of magic. His spontaneity and energetic style of cooking makes him one of my favourite chefs – ever since I would never miss a single episode of his cooking show, and would always be armed with a piece of pen and paper to copy down recipes that I would like to try. I have always wanted to buy his cookbooks but they are too costly for a student like me back then. So I would go to the library and lug his thick and heavy cookbooks back and absorb all the beautiful food photos and delicious recipes – and then wishing I have the skills and equipment to make them. Regrettably I have only managed to post one recipe of his (back in 2009! I will update on it soon!) on this site… Many recipes that I’ve tried in the past are not satisfactory enough to be blogged here while some ended up as flops (due to my poor cooking skills). These recipes were somehow forgotten and not re-attempted – until now! Most carbonara served here in Singapore are very cream based – the pasta are swimming in lots of cream and milk and it’s just.so.gross. Maybe because I’m not a fan of cream and milk (different story for cream desserts and milk products), I really detested this version of carbonara. The true authentic carbonara should be made of egg yolks – and I had my first taste of real carbonara in Rome. The carbonara in Italy are extremely tasty and creamy because of the egg yolks – which is the main reason why I never got sick of their carbonara. When I returned back to Singapore, I searched for good egg-yolk-based carbonara recipes and tried them out, but many times I ended up scrambling the eggs… Until I learned the trick that to cook a perfect carbonara is to turn off the heat before pouring in the yolk mixture – and it worked! Now that I’ve learned the trick, I know I’m going to make carbonara on a regular basis – I’ll just keep the egg whites left from the recipe to practice baking macarons. 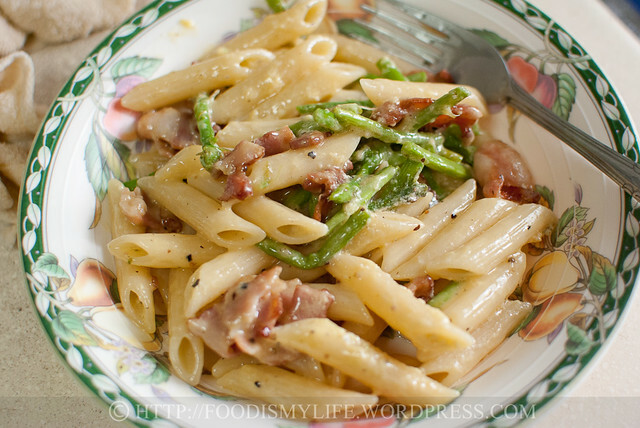 Jamie’s carbonara with bacon and asparagus is well-loved by X and I and it was a great comfort food that can be whipped up in less than 30 minutes (and we all love fuss-free, easy and fast but scrumptious meals… Right?). 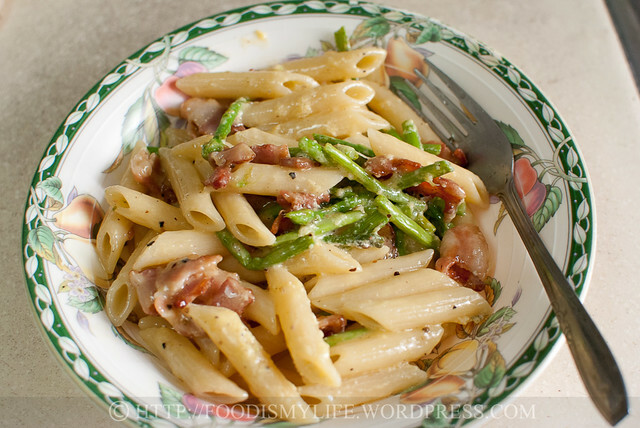 The smokey and salty bacon combines with the crunchiness of the asparagus and the creaminess of the pasta… it’s so good that we polished the whole dish off within minutes! It may not be authentic Italian as there’s still some cream added (not sure how strict a true Italian carbonara should be), but this recipe is definitely a keeper! First boil a pot of water and heat a large frying pan (big enough to accommodate all the pasta and ingredients) over medium heat. 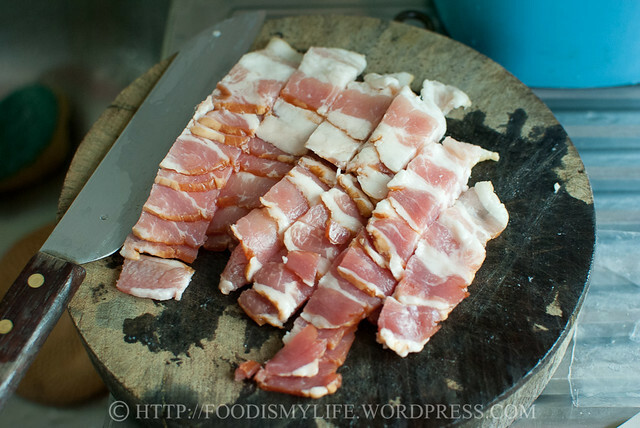 While waiting for the water to boil, chop up some good quality bacon. 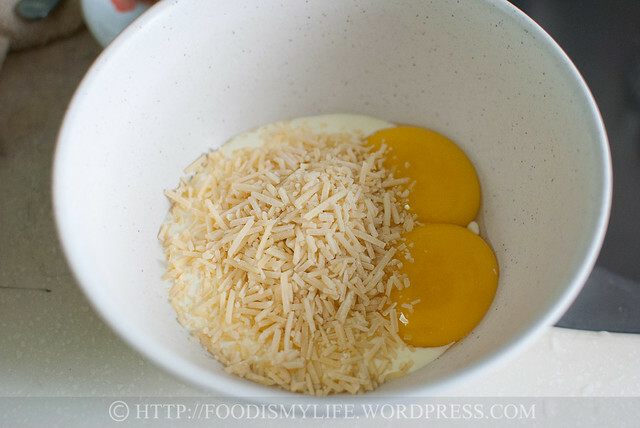 Then combine some cream, egg yolks, and Parmesan cheese. 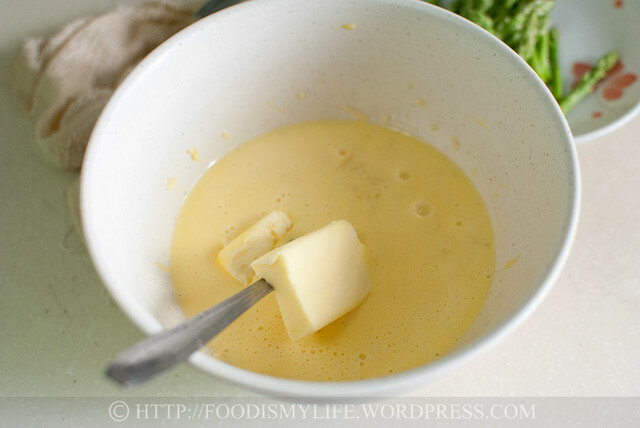 Add in a knob of butter – the hot pasta will melt the butter later. Chop up some asparagus – I actually wanted to throw in the stalks first then the heads, but ended up throwing them all at one go. 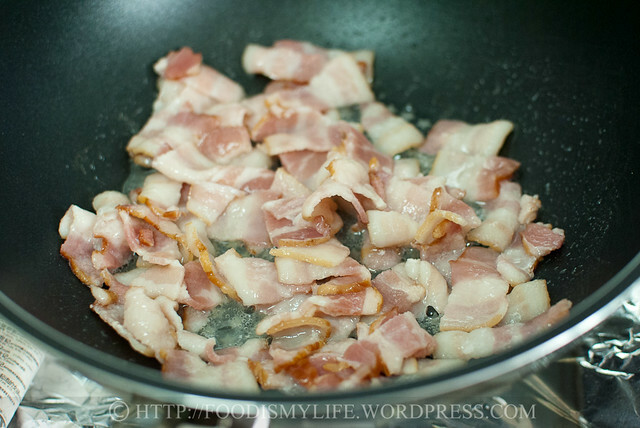 When the pasta is cooking, start frying the bacon – crispy is what we are looking for. When the bacon has started to crisp, add in the asparagus and cook until asparagus are tender but still slightly crunchy. Season with freshly ground black pepper. Yes it’s oily. Yes it’s fattening. But I promise you I’m not going to make this dish very often. Okay, maybe not, but at least I’m making all the fats worthwhile! Drain the cooked pasta and add it immediately into the bacon mixture and toss. Turn off the heat and drizzle in the egg yolks mixture, tossing continuously. Add in some pasta water if the mixture’s too thick for your liking. Plate and dig in immediately! View all other Jamie Oliver’s fantastic recipes tried out by other foodies here! First, boil a large pot of water. Season the water with salt - ½ tablespoon of salt per 1 litre of water. 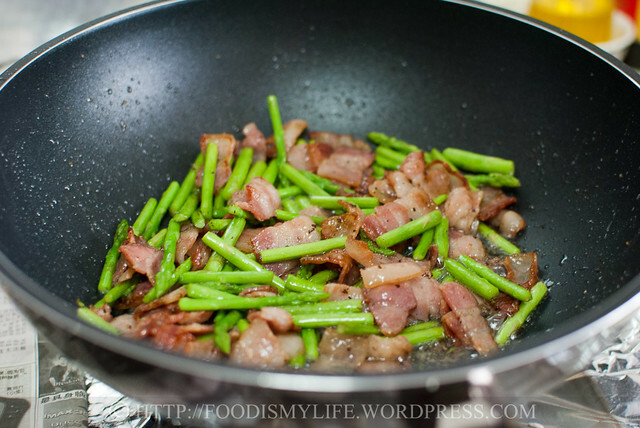 While waiting for the water to boil, grab a large frying pan (large enough to accommodate all the pasta, bacon and asparagus) and set it over medium heat. When the water has come to a boil, add in the penne and cook until al dente, per package's instructions. When the bacon is starting to crisp, add in the asparagus (if you're using thick asparagus, add them in slightly earlier as they'll take a longer time to cook). Stir-fry until the asparagus are tender. Season with freshly ground black pepper - do not add salt as the bacon and Parmesan cheese are very salty to begin with. Serve immediately (cold carbonara are yucky). Timing is very essential when making this dish – your pasta should be freshly cooked out of the water and added into the pan immediately after draining, so the pasta heat will heat the egg yolks mixture into a creamy concoction. Use the best quality and freshest egg you can find for this dish – quality matters! Please, don’t call it carbonara!! its very yummy dummy i love it . This looks beautiful! I love the look of the baby asparagus to add some greenery. my boy will jump with delight if i cook him this delicious pasta dish! 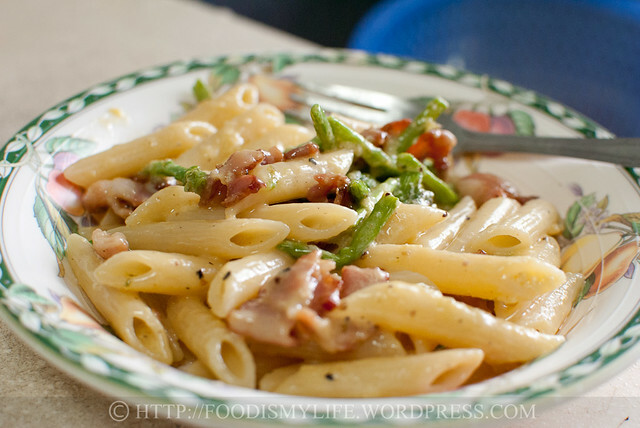 I totally have a craving for pasta right now and this carbonara is just up my alley! Delicious!! Wow. That looks fantastic. Carbonara is so yummy! I just love carbonara. 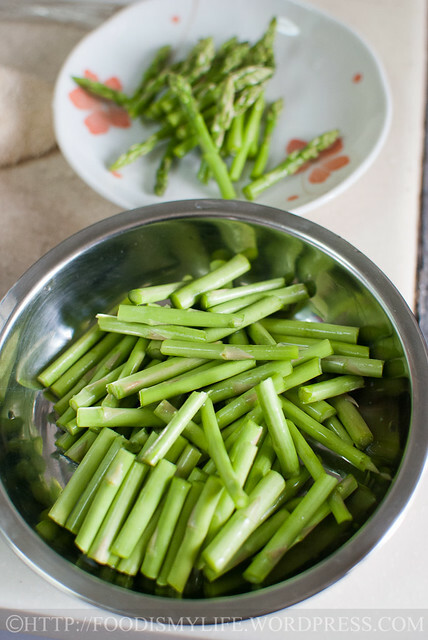 Asparagus is such a natural, perfect addition! Thank you! Wow I’m sure it’s not easy, to come up with a lot of egg-free meals. I hope your kid outgrows it soon too, so he can not only enjoy this carbonara, but also plenty of desserts! I’m sure your kids will, Joyce! I’m already wishing I have a plate of this in front of me right now… I gotta go grab some Milo to drink! Thanks for choosing him for the event, Zoe! I’m now watching his “30 minutes meal” TV show and I hope to whip up more dishes these few weeks! I hope you will like it as much as I do! Thank you! Thank you so much John! I used to call Jamie “my favourite guy” haha! Mmmm would love to have a taste of your version of carbonara! Oh my I’ll definitely give you a huge plate of carbonara, please don’t hurt me!! :p Glad you like it! Wonderful! 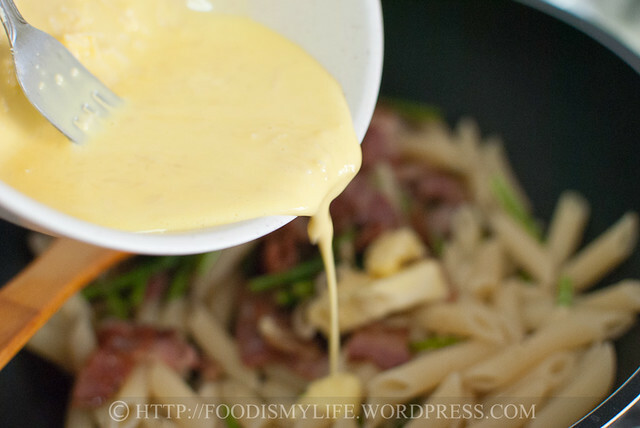 I love a good plate of carbonara without the goopy milk and cream sauce as well! Looks great! Oh, how I wish my youngest will outgrow his egg allergy. Not only for his safety and joy, but so we can reintroduce recipes with eggs! My absolute favorite chef, I love Jamie’s recipes. Carbonara is also one of my favorite pasta dishes and I love this fresh and contemporary spin on a classic. Your photo graphs are stunning, wish I had a big bowl right now. Oh my goodness, I had dinner almost four hours ago, and yes I am extremely hungry, after looking at your delicious plate of carbonara!! I wasn’t feeling hungry before that!! Looks utterly delicious! A definite must try, my kids would love me more if I make this for them! Hehe! I know what you mean about the cream based carbonara in Singapore that are often unsatisfactory. I only like them in desserts like you! Your carbonara is something that I would eat. I still watch his shows on Astro! 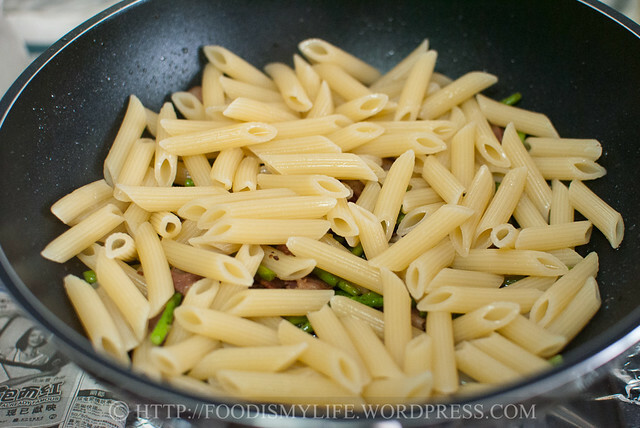 This is is definitely a favorite of mine, I love non-creamy pasta too! and yes, I wish I am having some of that lovely pasta of yours! I have been making lots of pasta dishes these past months but haven’t make this. Looks delish! This looks so delicious, wish I could have it for lunch! Love the combination, it is one of my must try dish. Thank you for the post! !